Ah, the Bedford Stop - probably the most highly trafficked subway stop off the notorious L train running from Manhattan to Brooklyn. 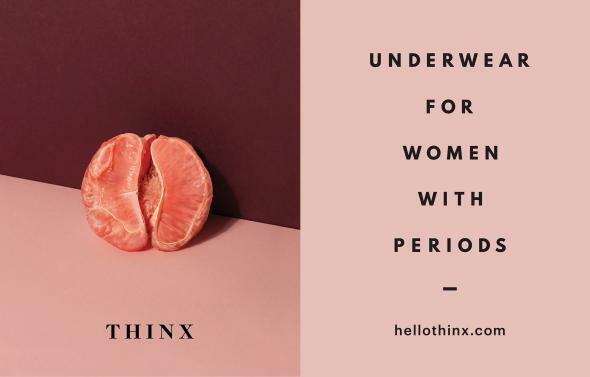 These ads from THINX, an underwear brand made for "women who have periods" has been popping up all over the Bedford stop and has been gaining a lot of attention both for its female empowerment message and the controversy of the ads. CEO and Founder Miki Agarwal spent 3 tireless years designing a pair of underwear that women can wear while they are menstruating - without pads or tampons! Yup- the technology enables all of that menstruation to be absorbed without it feeling like a diaper, so you can walk around shamelessly and comfortably all day. So despite their charity work and good intentions... why is this company dealing with negative backlash? Well, the big guys in charge of what media gets publicized on the MTA have suggested that the ads are inappropriate, lewd, and "oh god what if the children saw it?" The company has retaliated in saying that the women in the ads are more clothed than some of the other ads on the subway, featuring semi-naked women (see breast augmentation ads, beach body ads featuring semi-naked women -- these two ads were plastered all over subways this summer.) The company also claims that menstruation is something that every woman goes through and it is the reason why we have life- yet, so often we are conditioned to think of it as a taboo subject, made to feel impure or ashamed of it. Ultimately, MTA approved of the ads and starting November 10th, the ads have been featured all over the Bedford stop. The criticism? That has only helped THINX get more press, recognition, and of course a spike in sales! Of course, I can't speak on behalf of everyone but I couldn't be happier to see this topic discussed on a broad and mainstream level. THINX is one of a few examples of advertising that are pushing the boundaries and challenging what is perceived as normal or conventional. One of the reasons why I got into advertising was because I could become a part of a movement to address society in large and impactful ways: via brands, strategy and messaging. THINX is the perfect example of a company that is using advertising to be impactful. Check out the short film from the CEO and Founder below - she takes a trip to Uganda to learn more about how periods impact girls' development.